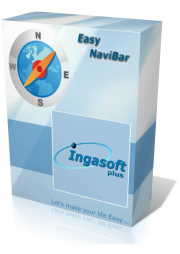 EasyNaviBar will instantly enable your Clarion applications with the popular MS Outlook© 2003/2007 style Navigation bar. It contains six different layout and color styles. EasyNaviBar consists of buttons, bands and groups. A band is one of the sections that comes to the front when you click on a button. The button and the group can be used as a standalone controls. Each group can be collapsible/expandable and contains different controls like Button, CheckBox, RadioButton, PropertyGrid, TreeView, WPF TreeView, Label, LinkLabel, TextBox, RichTextBox, Picture, each internal controls supports current OS theme. As part of the new, easier-to-use Microsoft Office Outlook 2003/2007, the Outlook Bar from earlier versions of Outlook has been replaced by the new Navigation Pane (Navigation Pane: The column on the left side of the Outlook window that includes panes such as Shortcuts or Mail and the shortcuts or folders within each pane. ), which provides centralized navigation and easy access to sharing features. The EasyNaviBar consists of buttons (1), bands (2) and groups (3). A band (2) is one of the sections that comes to the front when you click on a button (1). Each band (2) consists from groups (3) or different controls itself. Each group can be collapsible/expandable and contains different controls like Button, CheckBox, RadioButton, PropertyGrid, TreeView, WPF TreeView. This controls list can be extended with the other different controls like combo, date picker, some WPF-superhighControl etc, you name it! normal, when its hovered by the mouse, and when it's the active button or when the button is down. A group has two states, either it's expanded and all child controls are visible or it's collapsed and only the header is visible.